Background: Psoriasis is a chronic inflammatory hyper-proliferative disease of the skin, scalp, nails, and joints. It has been hypothesized that prolactin (PRL) may modulate the skin immune system and may be involved in the pathogenesis of psoriasis. Psoriasis exerts significant, negative impact on patients' quality of life. Relatively high rates of depression are reported in patients with psoriasis. Objectives: The aim of this work was to study the possible role of PRL in the pathogenesis of psoriasis and its correlation with the disease activity and emotional status of the patients. Subjects and methods: This study included 30 patients with chronic generalized psoriasis and 10 healthy subjects served as controls, attending the Outpatient Clinic of Dermatology and Venereology Department, Tanta University Hospital. Serum samples were taken from all patients before and after 4 weeks of treatment with 25 mg / week of methotrexate (MTX) (I.M injection) for detection of PRL serum levels by ELISA, while serum samples were taken from control subjects once for comparison. Psychological instruments; [The Hamilton Depression Scale(HAMD) and The Hamilton Anxiety Scale(HAMA)] were used to screen the broad range of psychological factors that have been implicated in psoriasis. Results: Serum PRL levels were statistically highly significant among patients compared to controls, with significant decrease among patients after treatment. A significant positive correlation was found between PRL serum levels and PASI score before and after treatment. Correlations between HAMA and HAMD with PASI were statistically significant before and after therapy, and so the correlations between HAMA and HAMD with PRL serum levels were also statistically significant before and after therapy. Conclusion: Prolactin seems to have a role in the pathogenesis of psoriasis. This role may represent a cause and/or a consequence of psoriasis pathology. The most likely scenario is that PRL enhances interferon-induced chemokine production in keratinocytes, thereby facilitating cutaneous T-cell infiltration. This raises the intriguing prospect that PRL may offer a novel future therapeutic target in psoriasis and other skin diseases that worsen in response to psychological distress. The aim of this work was to study the possible role of PRL in the pathogenesis of psoriasis and its correlation with the disease activity and emotional status of the patients. Including personal history, history of the disease (age of onset, duration and extension of the disease), past history (history of drug intake, lactation, menstrual irregularities in females and andrological complaints in males) and family history. Each patient received 1cm / 25 mg / week of methotrexate (MTX) for 4 weeks (I.M injection). Clinical assessment consisted of clinical response determination after 4 weeks. Photographs of the body sites affected by psoriasis were taken for each patient before and after the end of treatment. The clinical response to therapy was scored by using PASI score. All studied patients were subjected to the following laboratory investigations:-Complete blood picture, liver and renal function tests, chest and brain x ray and abdominal Ultrasonography. Hormonal assay that included serum PRL measured by ELISA technique before and after the duration of treatment with MTX (4 weeks). The PRL was measured by using DRG kit supplied by Clinilab ( Louhi-Finland). The specimen was taken between 8-10AM, blood was collected by veinpuncture, allowed to clot, the serum separated by centrifugation at room temperature and stored at 20ºC until used. 25μl of each standard, control and samples were dispensed into appropriate wells,100 μl Enzyme Conjugate was dispensed into each well, and incubated for 30 minutes at room temperature, then the wells was rinsed 5 times with distilled water,100 μl of Substrate Solution was added to each well and was incubated for 10 minutes at room temperature, the enzymatic reaction was stopped by adding 50 μl of Stop Solution to each well. The questions of the 2 questionnaire were asked to the patients before and after the duration of the treatment with MTX. Statistical presentation and analysis of the present study was conducted, using the mean, standard error, student t- test and Chi-square, by SPSS V17. Statistical significance was determined at a level of P < 0.05. In this study the duration of the psoriasis ranged from 2 years to 43 years, with a mean of 14.0 ±12.382 years. As regards family history, 2 out of the 30 patients had positive family history (6.67%). According to PASI score, 7 patients (23.33%) were classified as moderate psoriasis, 6 of them became mild (Fig 1) and 1 remained moderate after therapy, 23 patients (76.67%) were classified as severe psoriasis, 8 of them became mild, 9 became moderate (Fig 2) and 6 remained severe after therapy. There is a significant decrease in the value of PASI before and after therapy (Table 1). Table (1): The values of PASI score before and after therapy. Serum levels of PRL in the group of patients ranged from 31.5 ng/ml to 80.6 ng/ml with a mean and SD of 49.590 ng/ml ± 15.473 in comparison with controls that ranged from 7-20 ng/ml with a mean and SD of 14.00 ± 5.228, so the cutoff point between control group and patients group is 20 ng/ml (Fig 3). There is statistically highly significant increase among patients (P=0.000). As regards the serum levels of PRL after therapy, they ranged from 9.0 to 40.0 ng/ ml with a mean and SD of 20.553 ± 8.276 with significant decrease in comparison with values before treatment (Table 2). Fig 3: Cut off point between patients and control as regard PRL. Table (2): Serum PRL levels in psoriasis patients before and after therapy. The values of HAMA score before therapy ranged from 3.0 to 29.0 with a mean and SD of 13.733 ± 6.938, while after therapy the values significantly decreased, they ranged from 1.0 to 18.0 with a mean and SD of 7.600 ± 5.076 (p=0.000) (Table 3). The values of HAMD score before therapy ranged from 2.0 to 23.0 with a mean and SD of 9.700 ± 6.353, while after therapy the values significantly decreased, they ranged from 1.0 to 18.0 with a mean and SD of 5.100 ± 3.772 (p=0.000) as shown in (Table 3). Table (3): Comparison between the values of HAMA and HAMD scores before and after therapy. Correlations between HAMA and HAMD with PASI and PRL before therapy were statistically significant (Table 4).Correlations between PRL with HAMA, HAMAD and PASI were statistically significant after therapy (Table 5)..
Table (4): The correlation between HAMA and HAMD with PASI and PRL before therapy. Stress and hormonal factors have been reported to be implicated in the pathogenesis of psoriasis. It has been hypothesized that PRL may modulate the skin immune system and may be involved in the pathogenesis of psoriasis. Functional PRL receptors are detected on keratinosis and PRL effectively increased the in vitro growth of keratinocytes in psoriasis. PRL acts as a neuroendocrine modulator of both skin epithelial growth and the skin immune system. It is hypothesized to be integrated in a multilevel neuroendocrine-immune communication along the ''brain-skin axis''. Stress has been reported to trigger and exacerbate psoriasis; therefore, it may represent a link between prolactin and the disease pathogenesis. So, the aim of this study was to study the possible role of PRL in the pathogenesis of psoriasis and its correlation with the disease activity and emotional status of the patients. Our results revealed that serum level of PRL was significantly higher in psoriatic patients than controls and were significantly reduced after treatment and there was a correlation between serum PRL levels and PASI. These results are consistent with those of Dilme-carreras et al. , their study included 20 patients of psoriasis, and 20 healthy controls. PRL levels were measured by Enzyme- linked Immuno Assay (EIA) in serum of patients of psoriasis before and after treatment with tacalcitol ointment 4μ / g once a day for 6 weeks and disease severity was assessed by PASI in all patients. Serum levels of PRL were significantly higher in patients than controls before treatment. They also found that PRL levels were significantly reduced after treatment with tacalcitol and there was a correlation between pretreatment serum PRL levels and PASI. Also in a study done by El-Khateeb et al. , who initiated a study including 15 psoriasis patients and 15 healthy volunteers as controls, PASI score was evaluated, and PRL levels in serum and blister fluid were assessed by (ELISA). PRL levels were significantly elevated in blister fluid of psoriatic lesional skin. Correlations between PASI score and different serum PRL levels in lesional and non-lesional skin were insignificant. Significant positive correlations of prolactin level were observed between lesional and non-lesional skin in psoriasis and between serum and clinically normal skin in both psoriasis and control subjects. Regana and Millet, 2000 reported three cases of women with plaque-type psoriasis that severity and extent of the skin lesions correlated with development of a prolactinoma . All three patients were treated with bromocriptin. They had normalization of PRL level and also improvement of psoriatic lesions. Then, they discontinued bromocriptin and all cases had relapsed in psoriasis. On the other hand Azizzadeh et al. found that although levels of serum PRL, which were determined by ELISA in 30 psoriatic patients compared with 30 controls using Pishtaz Teb kit, has a mean level in psoriatic patients was not significantly higher than the control group. However, there was statistically significant relation between severity of disease and serum prolactin. Our results revealed also that, values of HAMA and HAMD score were significantly high in all psoriatic patients, they were significantly decreased after treatment, and there was a correlation between these values and PASI. These results are in accordance with Verhoeven et al. who found a significant association between stress and disease severity. This prospective study of 62 psoriasis patients determined high levels of daily stressors to be related to an increase in disease severity 4 weeks later. In another study carried out by Erick Chern et al. , thirty-six patients with psoriasis receiving conventional treatment and 48 patients receiving the Goeckerman regimen (UV irradiation and coal tar) were recruited to the study. Clinical severity was evaluated weekly using PASI. Psoriasis Disability Index (PDI) and Hospital Anxiety and Depression Scale (HADS) questionnaires were applied at admission and one month after discharge. The mean PASI score in the Goeckerman group decreased and PDI scores decreased. HADS scores for anxiety and depression decreased significantly. In comparison with conventional therapy, the modified Goeckerman regimen showed similar clinical efficacy, with additional benefits in improving overall quality of life and psychosocial distress in patients with moderate/severe psoriasis, and more cost-effectiveness. Unlike the above studies Zachariae et al. showed that stress responders differed significantly from non-stress responders. Stress responders tended to self-report greater disease severity than non-stress responders, even though clinical measures of disease severity (e.g. PASI) did not vary between groups. Stress responders were, however, found to have more plaques of psoriasis on visible areas than non-visible regions. Prolactin seems to have a role in the pathogenesis of psoriasis. This role may represent a cause and/or a consequence of psoriasis pathology. This raises the intriguing prospect that PRL may offer a novel future therapeutic target in psoriasis and other skin diseases that worsen in response to psychological distress. 1. Griffiths TW, Griffiths CE, Voorhees JJ. Immunopathogenesis and immunotherapy of psoriasis. Dermatol Clin. 1995; 13: 739- 749. 2. Gottlieb AB, Kreuger JC, Wittkowski K et al.Psoriasis as a model T cell- mediated disease: immunobiologic and clinical effects of treatment with multiple doses of efalizumab, an anti-CD11a antibody. Arch Dermatol. 2002; 138: 591- 600. 3. Mowad CM, Margolis DJ, Halperin A et al. Hormonal influences on woman with psoriasis .Cutis 1998; 61: 257- 260. 4. Buskila D, Sukenik S ,Shoenfeld Y. The possible role of prolactin in autoimmunity. Am J Repord Immunol. 1991; 26: 118- 123. 5. Girolomoni G, Philips JT, Bergstresser PR. Prolactin stimulates proliferation of cultured human keratinocytes. J Invest Dermatol. 1993; 101: 275- 279. 6. Cooke NE. Prolactin: normal synthesis, regulation, and actions. In: Endocrinology. De Groot LJ, (ed). Philadelphia: W.B. Saunders, 1989; pp 384-407. 7. Sánchez Regaña M, Ojeda R , Umbert P.[El impacto psicosocial de la psoriasis].Actas Dermosifiliogr. 2003; 94: 11- 16. 8. Dilmé-Carreras E, Martin-Ezquerra G, Sánchez-Regaňa M et al. 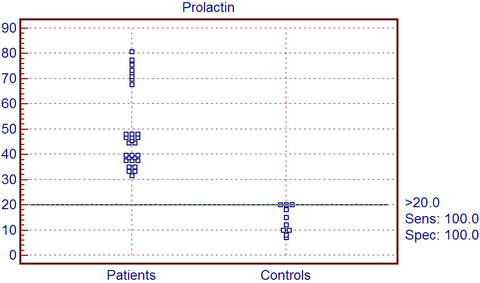 Serum prolactin levels in psoriasis and correlation with cutaneous disease activity. Clin Exp Dermatol. 2010; 2: 1- 4. 9. Feldman SR, Krueger GG. Psoriasis assessment tools in clinical trials. Ann Rheum Dis. 2005; 64: 65- 68. 10. Utolia M, Ruouslahti E, engvall E. Methods. J Immunol. 1981; 42: 11- 15. 11. Williams J. A structured interview guide for the Hamilton Depression Rating Scale. Arch Gen Psychiatry 1988; 45: 742- 747. 12. Borkovec T, Costello E. Efficacy of applied relaxation and cognitive behavioral therapy in the treatment of generalized anxiety disorder. J Clin Consult Psychol. 1993; 61: 611. 13. Damasiewicz-Bodzek A, Kos-Kudła B. [Hormonal factors in etio-pathogenesis of psoriasis]. Pol Merkur Lekarski 2007; 22: 75- 78. 14. Azizzadeh M, Malek M, Amiri M et al. Does prolactin indicate severity of psoriasis? Iran J Dermatol. 2009; 12: 79- 81. 15. Paus R, Theoharides TC, Arck PC. Neuroimmunoendocrine circuitry of the ''brain-skin connection''. Trends Immunol. 2006; 27: 32- 39. 16. El-Khateeb EA, Zuel-Fakkar NM, Eid SM et al. Prolactin level is significantly elevated in lesional skin of patients with psoriasis. Int J Dermatol. 2011; 50: 693- 696. 17. Sanchez Regana M, Umbert Millet P. Psoriasis in association with prolactinoma: three cases. Br J Dermatol. 2000; 143: 864- 867. 18. Verhoeven EMW, Kraaimaat FW, de Jong EMGJ et al. Individual differences in the effect of daily stressors on psoriasis: A prospective study. Br J Dermatol. 2009; 161: 295- 299. 19. Erick Chern, Diana Yau, Ji-Chen Ho et al. Positive effect of modified Goeckerman regimen on quality of life and psychosocial distress in moderate and severe psoriasis. Acta Derm Venereol. 2011; 91: 447- 451. 20. Zachariae R, Zachariae H, Blomqvist K et al. Self-reported stress reactivity and psoriasis-related stress of Nordic psoriasis sufferers. J Eur Acad Dermatol Venereol 2004; 18: 27- 36. 21. Jancin B. Prolactin may explain the stress trigger of psoriasis. Skin & Allergy News.2008; 30. 22. Hijenen DJ, Ten Berge O, Timmer-de Mik L et al. Efficacy and safety of long-term treatment with cyclosporin A for atopic dermatitis. J Eur Acad Dermatol Venereol. 2007; 21: 85- 89. 23. Foitzik K, Langan EA, Paus R. Prolactin and the skin: A dermatological perspective on an ancient pleiotropic peptide hormone. J Invest Dermatol. 2009; 129: 1071- 1087. 24. Chuang E, Molitch ME. Prolactin and autoimmune diseases in humans. Acta Biomed 2007; 1: 255- 261.